Are you a sportsman, a traveler, a heavyweight lifter or does your work involve straining your back at the regular time? The chances might be high that you get regular back problems more often than others. Today, one in every five people are facing backache problems or issue related the to spine, the problem has often lead to making people feel lethargic, weak and also rupturing some of the internal body parts. In a recent study done it was told that the most important part of the body is not the brain, neither the heart but it is the spine as it helps our body in shaping and developing its posture, helping us to walk, run, and stand, also giving the whole body the strength and the endurance power to carry out day to day activities. So keeping the back problems under control can help you increase you’re personal as well as professional life. Of all the body parts our spine is the one which works hard all day and then they finally have an opportunity to relax and get rejuvenated. To make the most of this time, providing a great mattress will allow the spine to rest in a best and comfortable way. Choosing a mattress and pillow is largely based on personal preference and majorly depend upon your preferred sleep positions as well. Your lower back and abdominal muscles need to be strong in order to support the spine and take pressure from the lower back. But most of the core muscles are rarely used during everyday activities; that’s why it is suggested to exercise for 30 minutes to 1 hour a day in order to flex those muscles. For more information regarding the required exercises please visit a doctor to help you guide the right exercise. Whether we are walking or exercising the shoes which we wear plays a very important role in supporting our lower back. Great shoes provide a supportive base that helps the spine keep upright but you should also make sure that if fits your size and comfort level as well. Lastly but not the least the massage done at right place has a huge benefit. A good massage will help you increase the body’s own natural painkiller—which in turn may allow you to improve your back problems. A proper massage can also help you to encourage the blood flow, which in return brings healing nutrients helping in a speedy recovery. But, if these things don’t work and the problem persists for a long time then there then, you may need a surgery. What is Lumbar spine surgery? What are its types? The lumbar nerves are the five pairs of spinal nerves which emerge from the lumbar vertebrae which are present on either side of the spinal cord. The lumbar spine is a remarkably well-engineered structure which connects the bones and the muscles, these all contribute together around the lumbar nerves creating strength and endurance to the whole structure. If the pain starts with lumbar nerve and gets too intense then generally speaking in medical terminology it’s time to for a surgery. This surgery about the spine is called as the lumbar spine surgery. The surgery helps get rid of symptoms such as unparallel pain and numbness in the lower body caused by pressure in the nerves of the spine. Spinal stenosis which is, narrowing of a section of the spinal column, which puts pressure on the nerves inside a slipped disc and sciatica. Some spinal injuries such as a fracture or the swelling of tissues may cause metastatic spinal cord compression when not treated might end up with a permanent rupture in the area. A spinal fusion surgery is done in order to stop the motion at a painful vertebral segment also keeping in mind that it should decrease the pain generated from the joint. Adding up a segment of the backbone known as bone grafting. Set up a biological response that can cause the bone graft to grow between the two vertebral elements to create a bone fusion. The boney fusion – which is done to replace a joint bone area with a fixed bone. 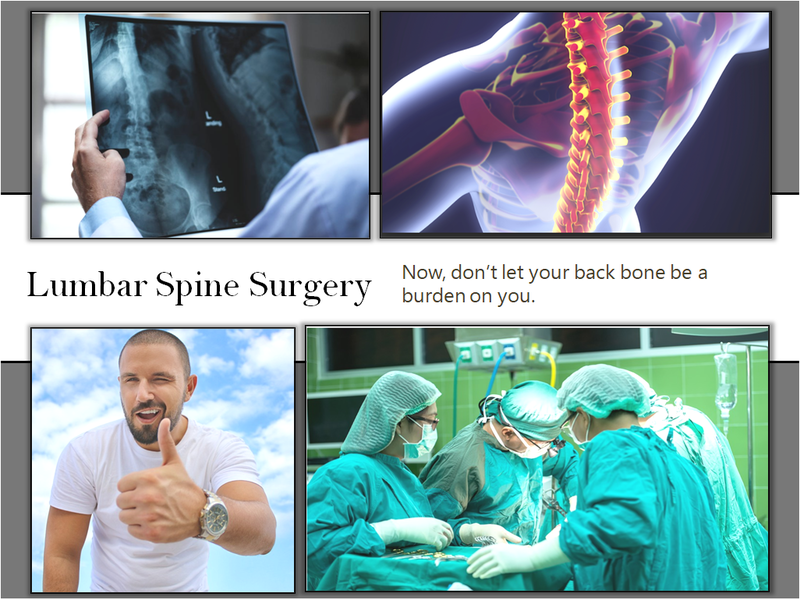 Protections after the Lumbar spine surgery? After you are done with the surgery, you will most likely be out of bed within 24 hours or more, and you can be on medications for at least 2 to 4 weeks. The traditional approach to recover with a back surgery has been to limit bending, lifting, or twisting for six weeks to close to three months. Healing of the opening and scars could take three to four months. Generally, after a surgery, you’ll receive instructions from the doctors on how to sit carefully, rise, and stand and do other activities. But it’s important to give your body time to heal, hence chances are your doctor will probably recommend you to restrict most of the activities which cause stress in the treated area. After surgery, be vigilant. It is best to report every small problem which you face such as fever, nausea, increased pain, headache or any infection to your doctor right away. Follow a plan which might be given by the doctor. Learn to lift smaller weights and see the implications. Exercise regularly especially which is told by the doctor. Use proper sports equipment also doesn’t try to use it for long it hurts you back. Eat healthy as per the required diet. Stop smoking and avoiding consumption of alcohol. All said and done we should never forget that the spine is the central part of the nervous system, along with the brain, and the millions of nerves that send messages to the brain (which also controls the body’s function) are all connected to the spine. A healthy spine gives a way to the entire system, the strength of the body increases in endurance power, and provides support to the arms and legs, also helping in regular breathing and digestion.